There’s never a bad time to re-style your home and patio with new design trends. With the holidays approaching and a change in the weather, it’s good to adapt to your surroundings by adjusting them. Winter is the best time to gather around the fire pit. Whether you change the flooring in your home or just a simple decoration, there are plenty of routes to take. Here are just a few patio design trends you can resort to during the winter. While Florida isn’t prone to snowy weather, winter is known for its gloomy and dreary skies. Creating contrast is one of many patio design trends that will enhance a pop against the gloominess of winter. When putting together a subtle atmosphere, add a pop of color in one area of the room to give it some life. Think about using high contrast to enhance the formality of a room. 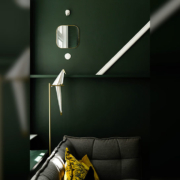 Choose a specific color scheme to go by and work around it to create a balanced living space that adds the right amount of contrast to your home. For some, winter is their happy place. And not just the feeling. When you think of cold weather, colder colors come to mind. Rather than warming up your patio, level it with its surroundings. Imitating mother nature can help keep your home up to date as the seasons change. Decorate your patio with cooler tones such as blues, purples, grays, blacks, etc. As much as rugs have been the default for outdoor design, porcelain is becoming the get-go. Because porcelain is durable and tends to mirror interior trends, it creates a smooth transition from indoors to outdoors. With its low maintenance and easy to clean surface, porcelain options make great patio design trends. Check out a previous Go Mobile Flooring article about outdoor flooring options. How exactly do you go about adding color to your space without overdoing it in one area? According to HGTV, the 60-30-10 rule is the way to go. 60% of the room’s color is on the walls, 30% of the room’s color is from furniture, and 10% is from decorations and other objects. Color is important when it comes to patio design trends. To help you come up with a color scheme, identify the boldest pattern in the room, whether it’s the drapes, rug, or paintings on the walls. Pull colors from that pattern and scatter them throughout your patio. Together, your patio will blend as a whole. At Go Mobile Flooring, we have plenty of options for you to explore. If you’re thinking about remodeling the flooring in your patio, make Go Mobile Flooring your first stop. We are able to bring our mobile showroom to neighborhoods in the Tampa area for further observation. Contact us today for more information.